I want to make this page much more presentable and informative but have placed some photos and a schematic here until I get time to expand it further. I do have a good deal of work to do on the system but it is fully functional. Click on the thumbnails to see full-size pictures. The Stargate is mounted on the right side of this rack. A 3000VA UPS, the Stargate PC, and Security Video Processor PC are on the bottom shelf. The Win 2000 server and DirecWay (from Earthlink) satellite Internet server are mounted in this rack. CD tower, network hubs, and the room microphones mixer and voice processor are also contained here. A 3000VA and 1400VA UPS are mounted in the bottom of this rack. All house lighting and receptacles are home wired to the control center in the basement. Here are 10 of the PCS modules (each controlling 4 lighting/receptacle circuits). 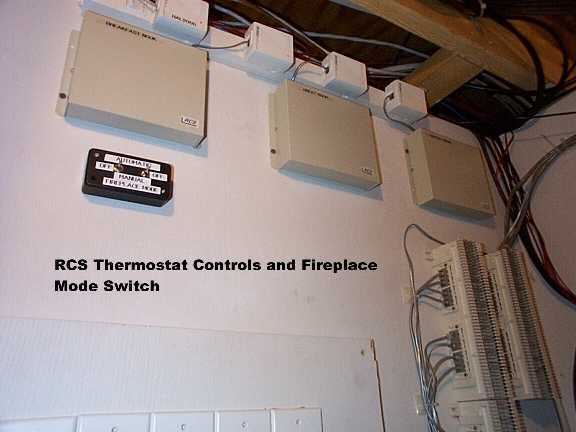 Three RCS TX15B thermostats are used to control the HVAC system. 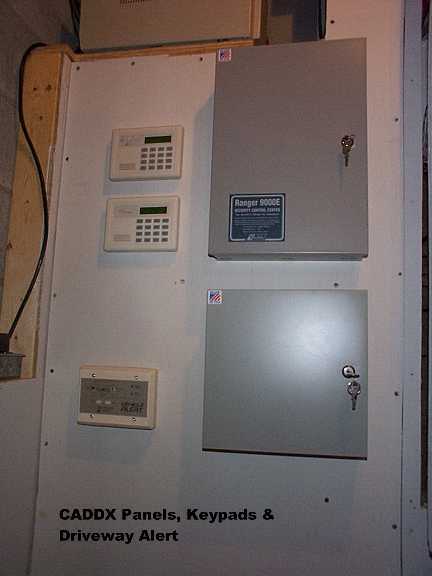 The control boxes are shown along with the manual override for the gas fireplace which is controlled by the HA system. This is the ChannelPlus Audio/Video distribution system. Signals from the Home Theatre DVD, Satellite 4DTV receiver, and VCR's are modulated and sent throughout the house. A 5-camera video surveillance system is also modulated and distributed. The security camera video signals are sent to a PC video processor and stored on disk for retrieval. These are time-lapsed but go into real-time mode in the event of alarm activation. A Vodavi digital-hybrid PBX is used. In addition to supporting proprietary phone sets, analog interfaces allow use of conventional equipment and connections to the Stargate/HA system. A Caddx alarm system with expander and 9016x interface is used for home security. Digital inputs on the Stargate and I/O expanders are interfaced with the alarm system. The driveway Vehicle Alert is also shown here. A "home-grown" distribution system is used for audio, video, telephone and data distribution. All rooms are home wired to the rear of this panel and connections to various systems are patched from the front. This allows for convenient changes to the system. This is the Kitchen PC which is used for the primary HA interface to the basement control center systems. HAL 2000 runs on this machine along with PCAnywhere to access other systems. These pictures are the latest addition of a 10Kva UPS (Uninterruptible Power System). I was fortunate enough to stumble upon it when a company centralized and shut down a data center. It consists of two cabinets - a control unit weighing about 500 pounds and a separate battery cabinet weighing about 400 pounds (both cabinets pictured at left). The battery cabinet contains 10 12-volt batteries wired in series (open battery cabinet pictured below left). It is fed from a 60-amp 240volt breaker and feeds a dedicated distribution panel (pictured at right bottom). I have all computer, audio/video, telephone, alarm, and other HA systems tied to this unit. According to periodic automatic tests on the unit, I have about 115 minutes of run time on battery power. An RS-232 port connects with the Stargate providing utility and backup power status.